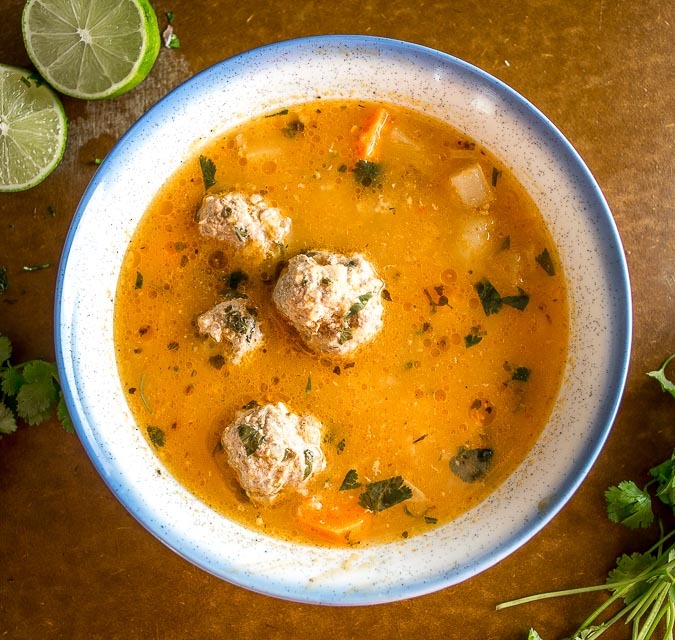 Yes, the meatballs are technically the star of this Albondigas Soup, but it’s the veggies that have the potential to turn it into a repeat recipe. Add in some potatoes and carrots, and even a handful of rice, and you’ve got a hearty, satisfying meal that reaches far beyond the limelighting meatballs. There’s lots of flexibility on the veggies too, so feel free to add in any others that you’re craving. The other wingman in this recipe is the tomato broth. 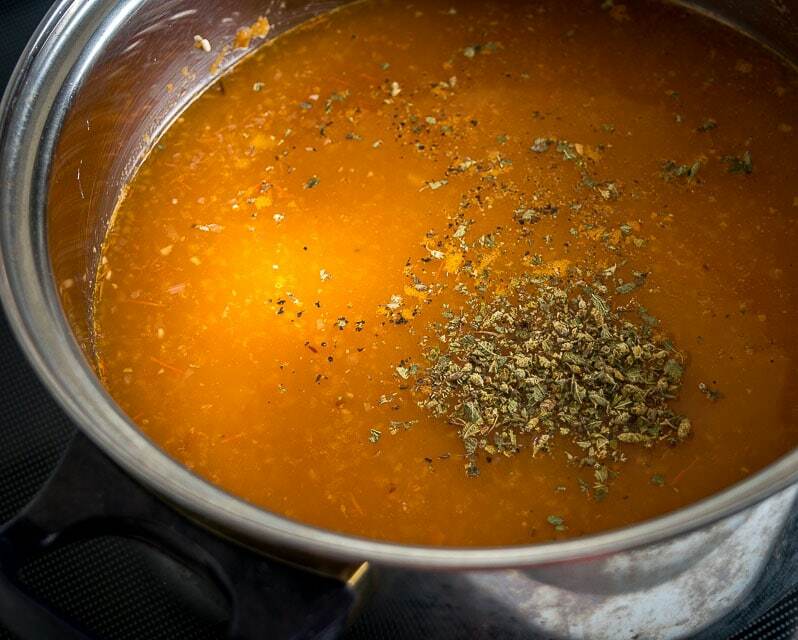 You may recognize it as the broth from our Chicken Tortilla Soup. It’s a common base for Mexican soups and there really should be a designated name for it so that more people get familiar with it. Souper Broth?! Basically you are sweetening up some onions and blending them with roasted tomatoes and garlic. Add them to a trustworthy stock along with seasoning and you’ve got a Souper foundation for an authentic dish. 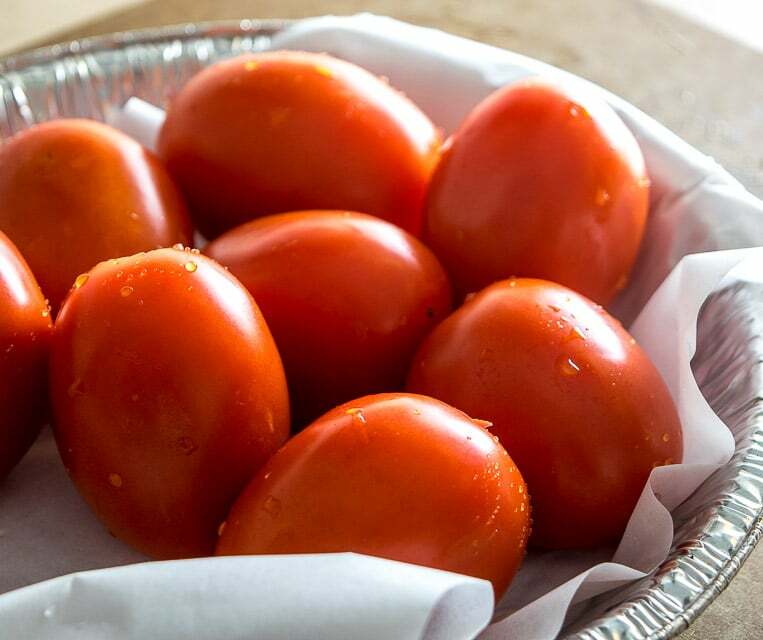 Start by roasting 4-5 tomatoes. There’s an extended simmer coming up so it’s not crucial to roast the tomatoes all the way, so I usually just plop them in a 400F oven until I need them. Meanwhile, saute 1.5 onions and 4-5 whole garlic cloves in a dollop of oil over medium heat. 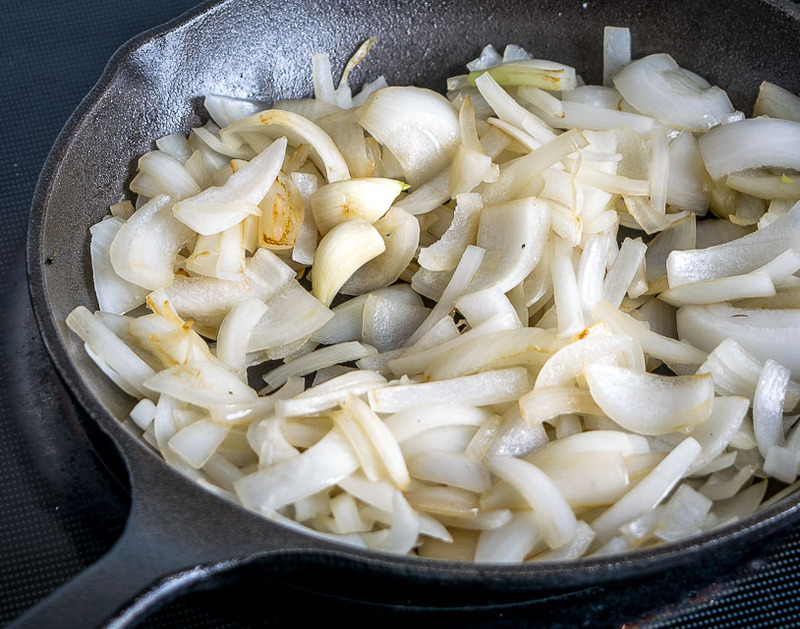 Let the onions cook until they start to brown, this will sweeten them up. I usually give them a pinch of salt at this point too. 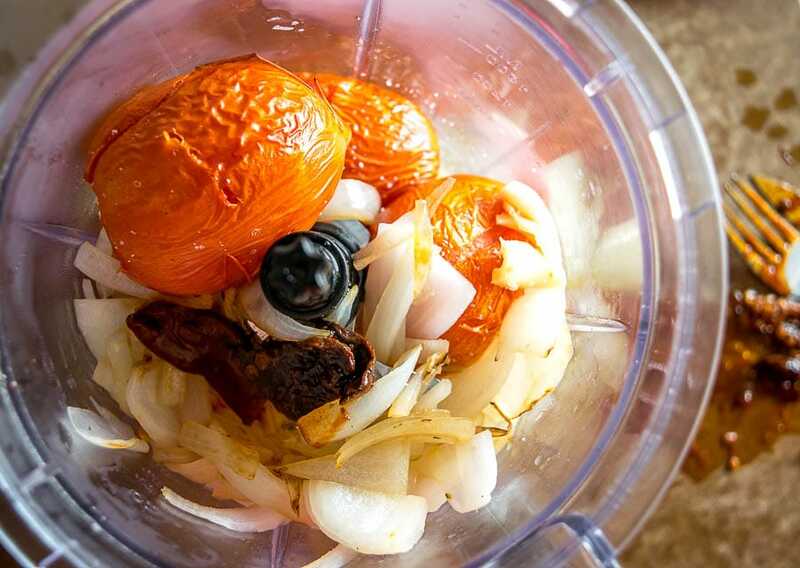 Add the onions and garlic to a blender along with the roasted tomatoes and a single chipotle in adobo. Combine well. I like this soup best when the heat is mild. A single chipotle will give you just a whisper of heat in the final product, but of course you can always amp it up by adding more chipotles. Try to get your hands on some stock that you trust. I’m using some vegetable stock for this batch, but chicken stock works really well too. Before adding the broth we’ll sweat the veggies for a few minutes to get ’em started. Let these saute in some oil for a few minutes and give ’em a pinch of salt. And keep in mind that you’ve got leeway on the veggies; feel free to add in anything else that you’re craving. Add the blender puree to the veggies along with 10-12 cups of stock. 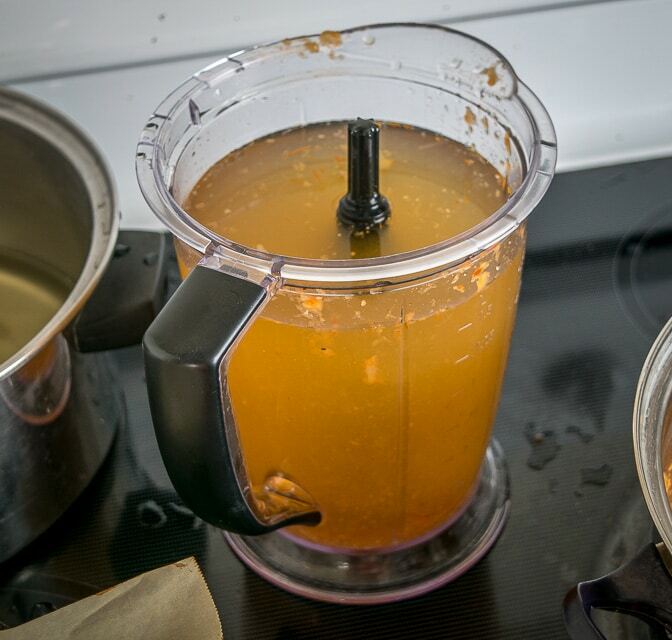 I usually pour the stock in the blender to rinse it out and then add it to the saucepan. And note that since we’ll be simmering the meatballs in the broth, you could get away with using water as the base, but good stock really does make it taste better so I think it’s worth adding it in. Bring this to a boil and then add the meatballs. This is an all-beef version of the Mexican Meatballs from a few weeks ago. They are loaded with plenty of mint, giving them a bright, fresh flavor. We’re also rolling these meatballs a little smaller in hopes of making them more of a team player in this dish — 27 meatballs from 1.5 lbs. of ground beef in this batch. And yes, this is a mondo batch of soup and will easily serve 4-5 people if not more. You could always cut the recipe in half for a smaller batch, or simply store some of the uncooked meatballs in the fridge for future Meatball Sandwiches. Gently add the meatballs to the broth. They’ll need about 10-15 minutes to fully cook, depending on how big they are. You can break one open to confirm it’s cooked all the way through, or you can use a thermometer to check that the insides are at least 160F. 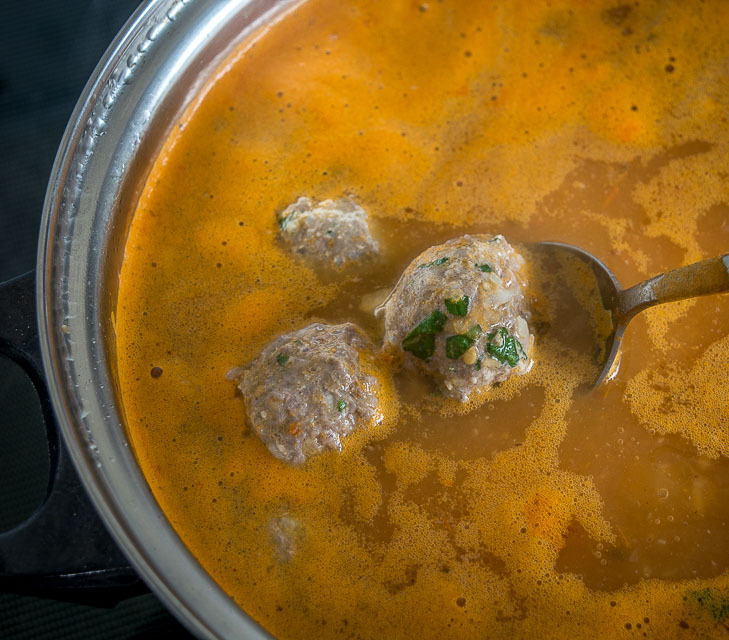 Keep in mind that you always have the option of browning the meatballs first before adding them to the broth (as seen in the Mexican Meatballs recipe). You’ll get some fat coming out of the meat during the simmer, and while it adds great flavor it could get greasy if you’re using higher fat ground beef. I used a lean ground beef for this batch and that’s a perfect fit for cooking them in the broth; if using a higher fat ground beef I would consider browning them first in a skillet and discarding some of the fat. Definitely take a final taste for seasoning. I added another generous few pinches of salt to this batch but keep in mind that this is dependent on which stock you use. Homemade stocks will probably need more seasoning than store-bought stocks. Serve immediately and be sure to get lots of the veggies in each serving bowl as they tend to sink to the bottom in the saucepan. 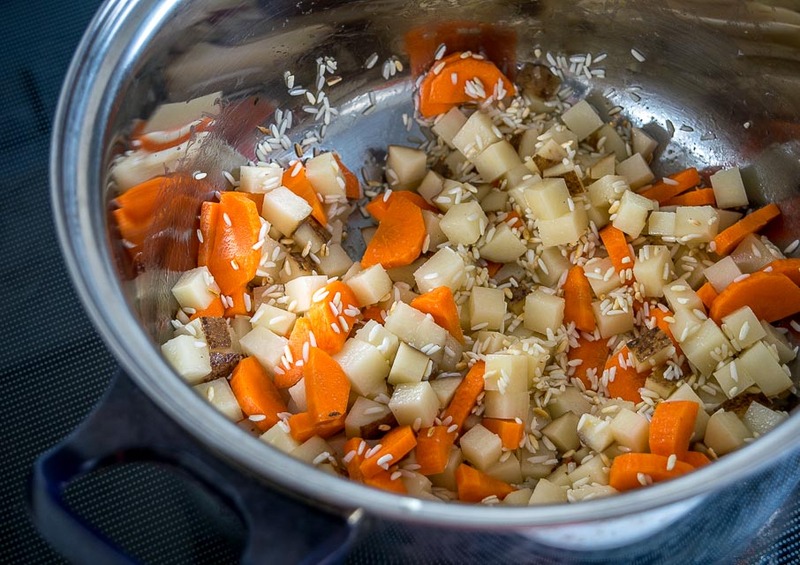 The rice and potatoes are delicious because, well, they’ve been simmering in Souper Broth. 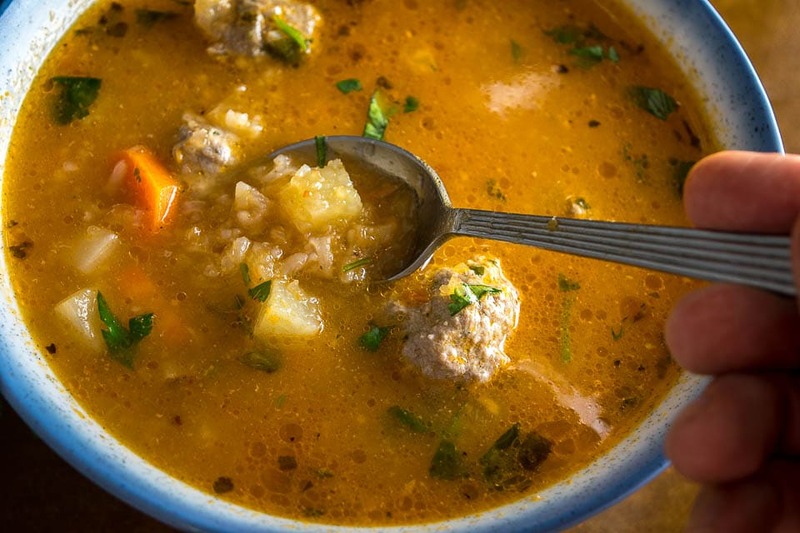 And a final burst of acidity works really well with this Albondigas Soup. A squeeze of lime does the trick for me, but you could also add a few drops of hot sauce if you want. Okay, let me know if you have any questions about this recipe — and keep that Souper Broth in mind for future dishes, it’s such a great base that you could nearly eat it on its own. 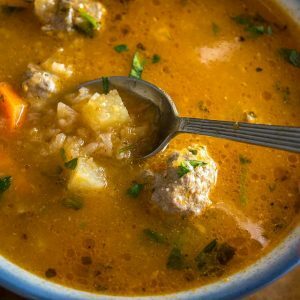 Here's an easy recipe for Albondigas Soup. I used all beef in this version but you could easily use pork or turkey. So good! Add the mint to a large mixing bowl along with 1.5 lb. 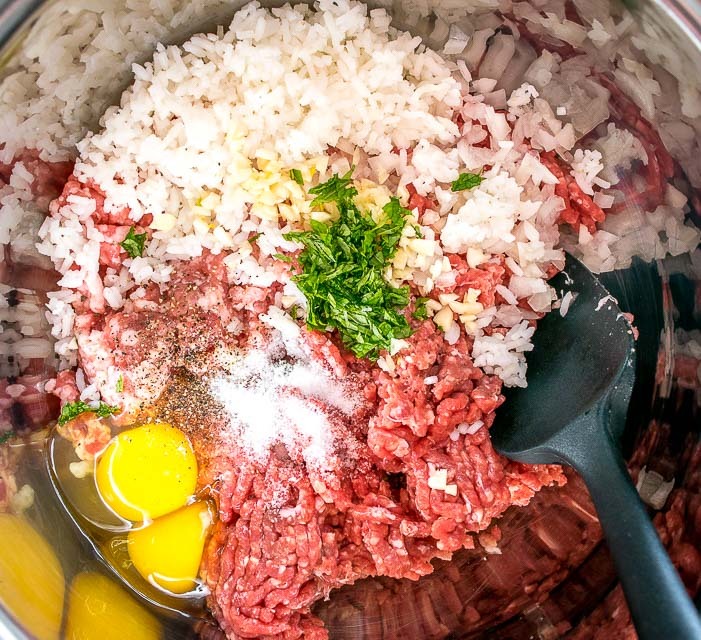 ground beef, 2 eggs, 1/4 onion (finely chopped), 3 minced garlic cloves, 2 teaspoons salt, freshly cracked black pepper, and 1/2 cup of cooked white rice. 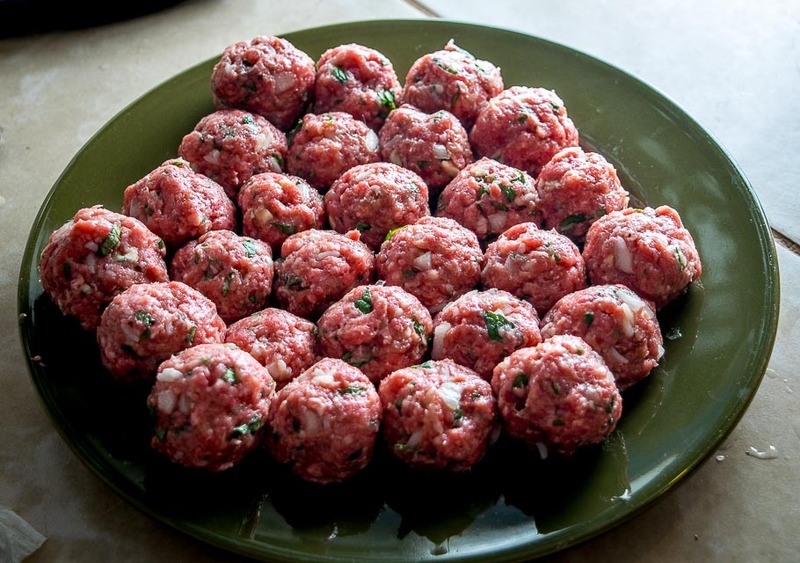 Combine well and then use your hands to form meatballs that are approximately 1 inch wide. Keeping your hands wet will help if the mixture is sticky. Saute 1.5 roughly chopped onions and 4-5 whole, peeled garlic cloves in a dollop of oil over medium heat. Cook until the onion is starting to brown. Add the onion, garlic, roasted tomatoes, and a single chipotle in adobo to a blender. Combine well. Finely chop the potatoes and carrots. Add them to a large saucepan along with 1/2 cup of rice and sweat them in some oil over medium heat for a few minutes. Season with a pinch of salt. Add the blender puree to the veggies along with 10-12 cups of stock, 2 teaspoons Mexican oregano, 1.5 teaspoons salt, and some freshly cracked black pepper. Raise heat and bring to a boil. Gently add the meatballs and reduce heat to a simmer. The meatballs will need approx. 10-15 minutes to cook dependent on how big they are, but I simmered this batch for 20-25 minutes to give the veggies time to cook. Take a final taste for seasoning. I add another generous pinch of salt to this batch. Serve immediately with freshly chopped cilantro and a squeeze of lime. Be sure to get lots of veggies in the serving bowls. Try to get your hands on some stock that you trust. I'm using vegetable stock for this batch, but chicken stock works really well too. Keep in mind that you always have the option of browning the meatballs first before adding them to the broth. You'll get some fat coming out of the meat during the simmer, and while it adds great flavor it could get greasy if you're using higher fat ground beef. I used a lean ground beef for this batch and that's a perfect fit for cooking them in the broth; if using a higher fat ground beef I would consider browning them first in a skillet and discarding some of the fat. 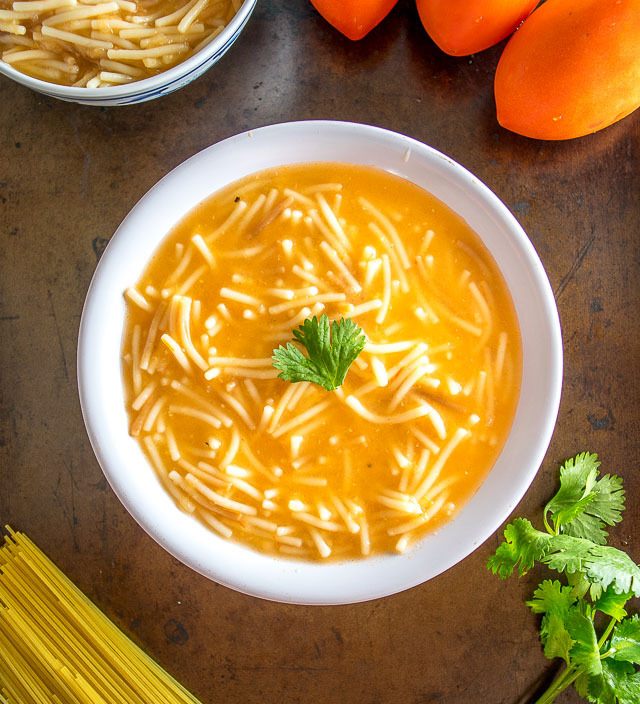 We also use the Souper Broth in our Sopa de Fideo. Psssst….here some great Cinco de Mayo recipes for this weekend. Enjoy! 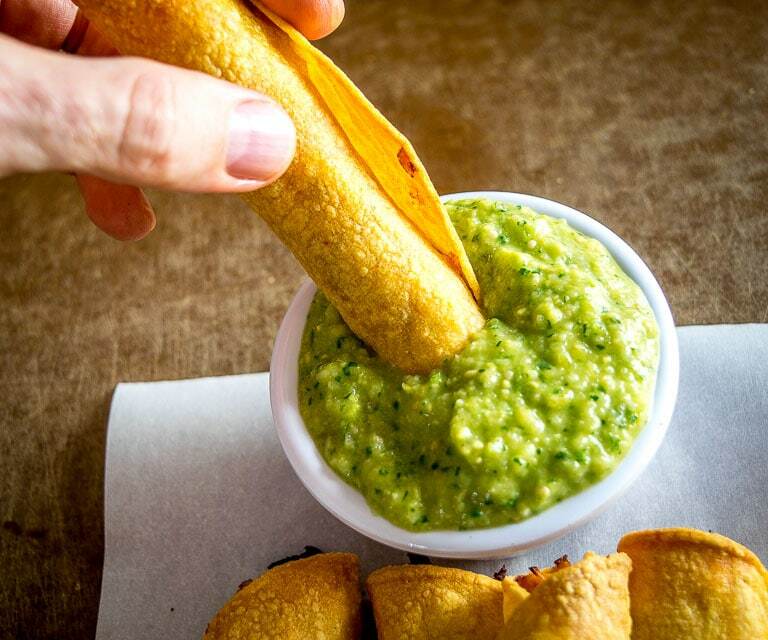 And our latest recipe is a batch of Chicken Flautas dipped in Avocado Salsa Verde. Or double it because it’s so good. Thanks John, hope it’s treating you well! hi! can this soup be frozen? Hi Joanna! Technically yes you should be able to freeze this soup, but to be honest I’ve never experimented with that before on this recipe so I can’t say for sure how much it would affect the flavor. Cheers. Hi Kruz! You can select Enchiladas from the Recipe tab up top and you’ll find plenty of good options. My favorites are the Ancho Chicken Enchiladas and Enchiladas Suizas. Cheers. What if you only have canned tomatoes? How many ounces of canned tomatoes does this recipe need? Hi Neffie! A typical roma tomato weighs around 2 ounces, so a half pound of canned tomatoes would be a good alternative for this soup. Yummm.. i made this tonight and it was fantastic. I did not have mint but i did have cilantro. I topped it diced avocado and a big saueeze of lime. I served with warm tortillas. Excellent. I love the addition of chipotle. Thanks! Nice that sounds awesome with the avocado and cilantro! Ahh that’s great Chris, thanks for letting me know! Hi Chris! A single chipotle shouldn’t add much spice at all given the quantity of this recipe but if it still seems spicy you can always dilute it with some more stock. If you discover that it’s too spicy while cooking, which is when you should because you should be tasting things, throw a potato in while it cooks to soak some up. This is what my mexican mom recommended for my white dad. Made this soup for my husband and he’s obsessed with it now. He gave some to his dad and now I have to make a batch for my in-laws. So delicious great recipe and easy to understand. Ha awesome Adri, so glad the fam is liking it! Hello Patrick, I have been searching for a easy Albondiga recipe and I came across you website. I will try it tonight, I’m excited to try your other recipes as well, and thank you for making it easy to print!! just hit the button and lets get cookin!! Thanks Frank I hope it treated you well! Thanks much for the feedback Blanca! And thanks for mentioning that you have been freezing it successfully as I haven’t tried that yet. Cheers. Thank you for posting this recipe. I love to cook new recipes and was so excited to find this one. I chose to double the recipe because I didn’t want to go through all the effort for only six servings. I followed the recipe exactly, except I used store bought chicken broth. There was a lot of chopping, due to my choice to double the recipe. But everything was very straight-forward and easy. I also knew that my family would be fine with using 3 of the Chipotle peppers and it was not too spicy. From start to finish, it took me about 2 hrs. I may be able to cook it more quickly next time around, but that was how long it took me from scratch (groceries in the bag) to eating (sitting and loving it!). I served it with fresh cilantro, queso fresco, and lime. I have to say…the flavors are absolutely incredible! This soup is so satisfying and well balanced, I had to leave a review. I will be eating this soup for lunch and dinner tomorrow, then freezing the remainder. I also cooked my meatballs in the broth for 30 mins total, they were about 2″ in diameter (I used gloves when rolling and it made the process very quick). Thanks again. Thanks much for your notes Dyonna, very helpful for other peeps who are new to the dish! I’m so glad you enjoyed the soup! Made this last week and it was a crowd pleaser! I doubled the chilis for more flavor and it still was not spicy (which is good). It reheats very quickly on the stove. I also doubled the recipe and froze half of it. Great recipe! Hey thanks for your feedback Liz! Good to know it froze okay for you, cheers. Is it possible to use ground turkey meat? Or will it change the flavor to much to the point it’s a blah soup? I’m only asking for the friends I have that don’t eat meat but they can eat chicken or turkey. Hi Dana! Yeah you can definitely use ground turkey and still get a good result — the broth has so much flavor and doesn’t depend too much on the exact cut of meat. You could probably even make a vegetarian version and still get happy campers. Cheers. I made this last night and it is incredible! Trying chili verde next. Thanks for your feedback Dana, so glad it was a hit for you! A question from a old Nana that could never handle hot chili and regretfully skipped that lesson at her own Nana’s table. Please explain chipotle in adobo? Where and how? It looks like a paste in your picture. Does it have to be prepared or can I buy it ready to use? Awesome, only used a little mint, in its place cilantro and a tad of oregano, this soup is fantastic ! Yup that will definitely work. Cheers Vince. I forgot to buy tomatoes and was all out of canned so I used some tomato paste instead. The broth was less clear than it probably would have been but it was still fantastic. Thanks! Hey thanks for your note Lisa, good to know that substitution still worked out. Cheers. I was craving albondigas soup, but have never made it before. Found this recipe and followed it almost verbatim except I added celery and swapped out 1/2lb of ground beef with ground pork l, added a little cilantro to the meatballs with the mint and doubled the chipotles. It turned fantastic and totally reminded me of the soup my grandma made me as a kid. I was hesitant about the mint, but it totally punched up the meatball flavor. The soup received raves from my Mexican friends who tried it as well. So glad I found this site, I already see several other recipes that I intend to try. This is a great, easy to follow recipe. Thank you! Thanks much Erik for your notes on substitutions/additions, very helpful for other peeps making the recipe! Cheers. Cheers Teresa, so glad you found this recipe!